Our main objective is to provide IT training to fresh learners and professionals spread over a wide geographical area with the association of efficient faculties staying anywhere in the world using latest communication technologies. We provide IT Training to corporates also. The efficient teams of our faculties make corporates to rely on us for their training needs and focus mostly on their actual core competencies. It ensures them to have good quality training from experienced faculty for cost effective pricing and reduces spending on in-house training. 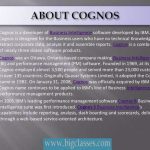 Cognos is a Business Intelligence (BI) and performance Management (PM) software. 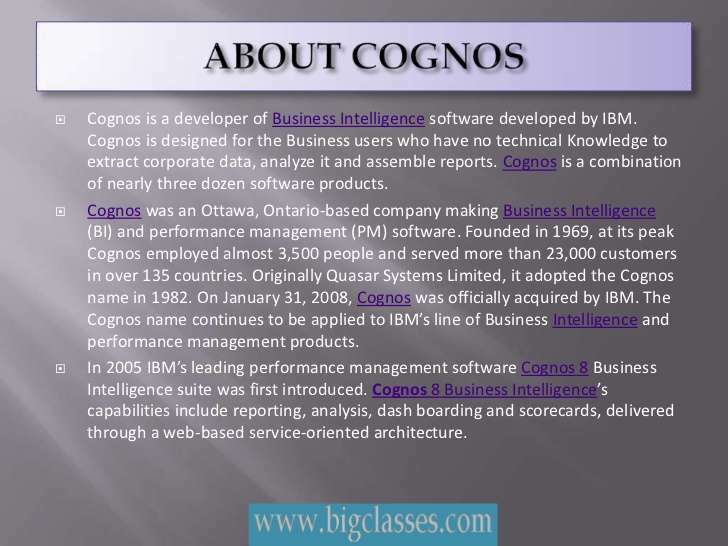 The main advantage of Cognos is, it is easy to access business information. It is developed to support business users without much technical knowledge to extract, retrieve, and explore corporate data to analyze it and assemble reports. It is introduced in Ottawa, Ontario-based Company in 1969. Later it was acquired by IBM in 2008. Latest version released recently is Cognos. The main purpose of the Cognos Business Intelligence is to provide right information at right time. Usually the data is extracted from several sources and changed into accurate and consistent data which is stored in Data Warehouse. 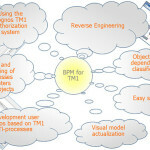 It is so flexible that the user can modify and share Cognos BI content using familiar applications and interface.